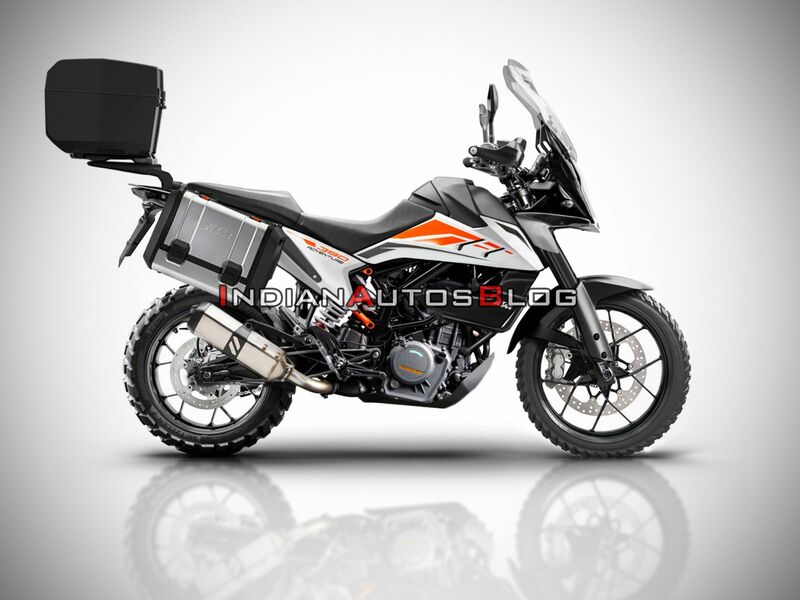 The KTM 390 Adventure render gives a glimpse of how the motorcycle would look with luggage panniers, top-box and a tall-windscreen. The entry-level adventure motorcycle in KTM’s portfolio would most likely benefit from a range of accessories that would enhance its long distance travelling capabilities. A heavily camouflaged test mule of the upcoming KTM 390 Adventure was spotted with luggage panniers and a top box and we asked our in-house render artist to create a digital image of what the motorcycle could look like with the optional accessories. Up front, the KTM 390 Adventure render gets a taller windscreen targeted to offer protection from windblasts at high speeds. This particular accessory was absent on the test mule but it would not be completely incorrect to expect one from KTM in the optional package. Knuckle guards, similar to the 390 Duke, would come as standard fitment although KTM could offer a pair of more rugged units as optional accessories. Designed to take on long-distance journeys, the KTM 390 Adventure would require sufficient amount of luggage space and to do that, KTM would offer panniers and a top box as optional accessories. The hard panniers offer better protection against various elements such as rains and dust that could damage the luggage. The hard panniers also protect the contents more efficiently in case of a crash. The top-box adds to the luggage carrying capacity of the motorcycle. KTM would most likely introduce two variants of the 390 Adventure and the accessories would be designed to fit both models. A metal-bash plate is expected to arrive as standard on the off-road spec variant while the same should be available as an accessory for the road-biased model. The cockpit of the 390 Adventure would include a full-digital display that would be identical to the unit on the 390 Duke. However, the adventure tourer could benefit from a turn-by-turn navigation system. KTM could also offer optional mounts for navigation systems. 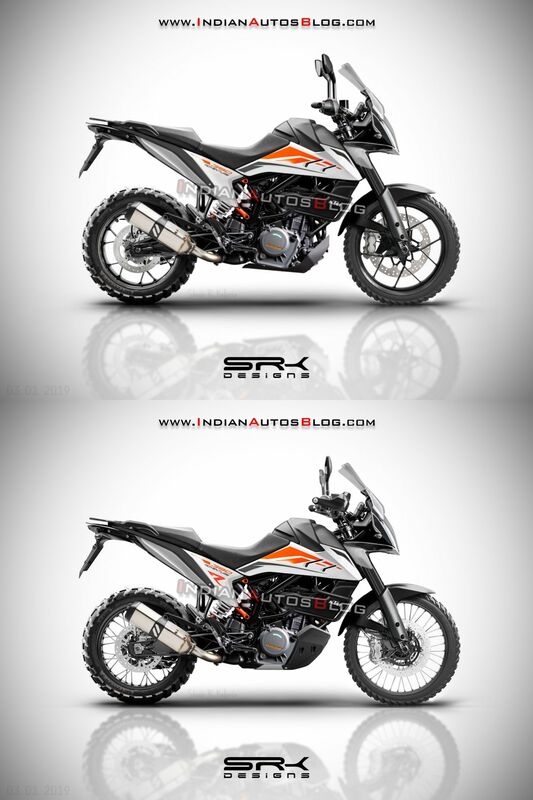 KTM 390 Adventure is expected to arrive in two variants - 390 Adventure (above) and 390 Adventure R (below). The R badge model will arrive with better off-road prowess than the standard model. Mechanical specifications on both - 390 Adventure and 390 Adventure R - would include a 373.2cc, single-cylinder, DOHC, 4-Valve, liquid-cooled engine that delivers 43.5 hp of power at 9,500 RPM and 35 Nm of peak torque at 7,250 rpm on the Duke. However, the gear ratio and mapping might get a revision for better low-end grunt.